Gather round, folks. Come closer. Can you all hear me? I’m going to tell you the secret to good health--Dietary Fiber. Welcome back. Over the years, I’ve written more than 40 blog posts on food and diet. On occasion, I’ve called out fiber. For example, describing my daily mix of cold cereals in A Healthful Breakfast, I wrote, I dislike sweet, avoid calories and saturated fat, and brake for whole grain, fiber and protein. Promoting Entomophagy, I pointed out that edible insects are generally high in protein, vitamin, mineral, fiber and good fat content. And now I’m delighted to review a study that really locks down the benefits of dietary fiber. The study examined the relationship between carbohydrate quality and health. Lest there be confusion about carbohydrates and fiber, I’ll note that fiber is a type of carbohydrate. Unlike most carbohydrates, which break down into sugar molecules, fiber passes through the body undigested. Carbohydrates are found in many healthy and unhealthy foods, most commonly as sugars, starches and fibers. be sure to take serving size (at top) into account. Healthy sources of carbohydrate, such as whole grains, vegetables, fruits, legumes and nuts, provide vitamins, minerals, fiber and important phytonutrients. Unhealthy sources of carbohydrates, such as pastries, sodas and other highly processed or refined foods, contain easily digested carbohydrates that may contribute to weight gain and promote certain diseases. 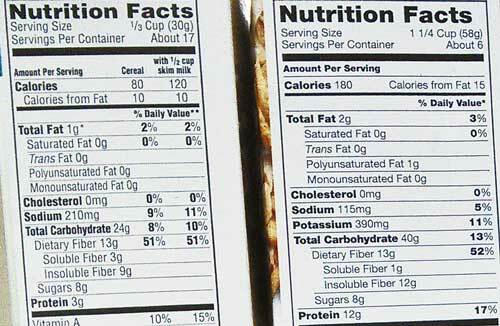 If you glance at nutrition labels, you’ll often see two types of fiber listed: soluble, which dissolves in water, and insoluble, which does not. Both are beneficial. The study was commissioned by the World Health Organization and conducted by researchers from New Zealand’s University of Otago and Scotland’s University of Dundee. The goal was to update recommendations for daily fiber intake and determine which types of carbohydrate protect best against non-communicable diseases and weight gain. Toward those ends, the researchers examined some 40 years of data. They conducted systematic reviews of 185 prospective studies and meta-analyses to statistically combine results from 58 randomized controlled trials. The prospective studies observed healthy participants over time, tracking nearly 135 million-person years of diets and health outcomes. The clinical trials evaluated the effects of specific diets versus control groups and involved 4,635 participants. All addressed indicators of carbohydrate quality and non-communicable disease incidence, mortality and risk factors. The prospective studies’ benefits of highest over lowest fiber consumers included a 15% to 30% decrease in all-cause and cardiovascular-related mortality, incidence of coronary heart disease, stroke incidence and mortality, type 2 diabetes and colorectal cancer. The clinical trials showed higher intakes of fiber had significantly lower bodyweight, systolic blood pressure and total cholesterol. Risk reduction associated with a range of critical outcomes was greatest when daily intake of dietary fiber was between 25 and 29 grams. Dose-response curves suggested that higher intakes of fiber could confer even greater protection against cardiovascular diseases, type 2 diabetes and colorectal and breast cancer. The researchers observed similar findings for whole-grain intake; however, they observed smaller or no risk reductions for the effects of low versus higher glycemic index or load diets. (Glycemic measures rank foods by how quickly they are digested and absorbed, causing a rise in blood sugar levels.) These findings were supported by certainty of evidence ratings using the GRADE approach. (from Mayo Clinic Staff, see P.S.). In line with the study results, the 2015-2020 Dietary Guidelines for Americans recommend women eat 25 grams of fiber a day and men 38 grams a day. Both would be quite a bit higher than the 15 grams the average American reportedly consumes. 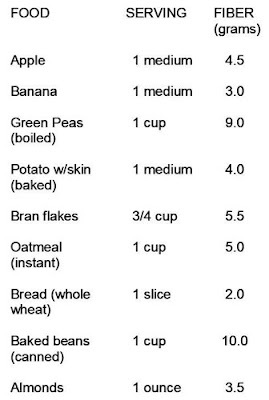 Specific foods to boost fiber consumption are listed in the guidelines as well as in various other sources (see P.S.). C’mon, this is not difficult. Thanks for stopping by.